The file Hightown v. Alpha 0.21 is a modification for Fallout 3, a(n) rpg game. Download for free. 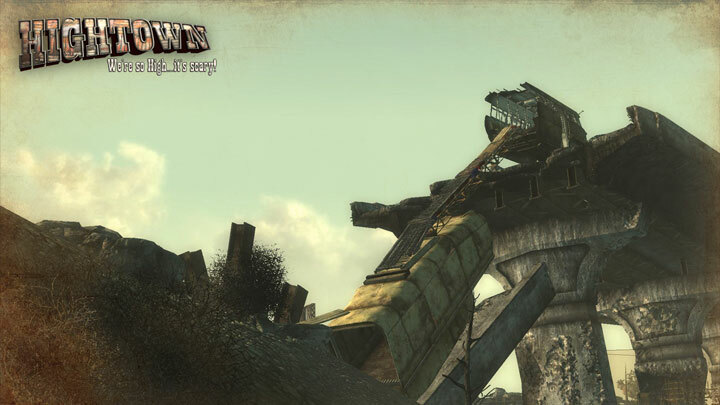 Hightown is a mod for Fallout: New Vegas, created by cambragol. This mod aims to add a completely new town to the DC area. Hightown is an old settlement, that has been built up over decades and decades in a sporadic series of spurts of building activity. The identity of the original builders and inhabitants has been lost long ago. Obviously the location was chosen by them for its ease of defence against the predators and dangers of the D.C. wasteland. In the years since it's founding the town has come to be slightly 'removed' from the affairs of the wastes, in contrast to others towns like Megaton, Rivet City, etc. A standard policy of 'shoot on sight' holds for guards on duty on the Underside, and this helps prevent too much rumor of it's existence from spreading. The town itself is akin to towns like the Hub or Den in Fallouts 1 and 2. Fairly lawless, inhabited by a mix of good and bad people, scavengers, survivors, addicts, prostitutes, wastelanders, raiders and the like. They are loosely bound together by the 'elders' of the town, who still cling to the rules that held the town together in times long gone. The town is not open to all, only to those who earn a place in it's membership. Traders and visitors who know of it are allowed in, but must leave by sunset, or have a place to sleep. The town survives how it can, which mostly means scavenging from the wastes, and drinking the polluted water of the region. Hightown has a dubious source of water, and a high defencible position, the two primary factors which ensure it's continued existence. The rules the town is still mostly run by also help to create a kind of community, though hardly one based on ideas of justice or morality. The laws of the wastes still hold sway in Hightown. Factions exist within the walls and ramparts, and tensions are rife. A balance has been struck between those who care about others and about creating a place of refuge and decency, and between those who are ruled by their baser needs, and the satisfaction of those needs. Interaction with these groups will throw the Player into a complex web of moral choices. The route through could be difficult. Or brutally simple. The Player will come into this setting and will be able to both interact with it, and effect it. Choices he or she makes will cause changes in the town, changes that will be reflected in it's appearance and makeup. Choices the player makes will effect the lives and fate of the citizens of Hightown. Choices the player makes could also resound beyond the walls of Hightown, and effect other places and peoples. 1. To complete it. This means that something will be released, though the final product will depend on other factors. 2. To match the standards of Bethseda. I would like this mod to match or exceed the production values of Bethseda, to allow players to continue the immersion of their Vanilla game. This goal is high, but there is no reason not to set the goal there. Achieving it is another matter. 3. To make the mod accessible. Meaning no use of DLC content. Really, the mod as it stands doesn't need to make use of any DLC content. Vanilla resources suffice. 4. To allow others to Build upon the mod. One man or even a team can only do so much. Keeping the mod open, and simple, could allow other modders to build mods or quests based in or out of the town. Which would be something one would expect to do or find when dealing with a vanilla or DLC town. NPC's have schedules, patrols, homes, combat taunts, alerts, random conversations etc. Wypakuj archiwum do „Fallout 3\Data\” i zaznacza w moda w launcherze.